First, you’ll need to link your Azendoo account to Zapier. 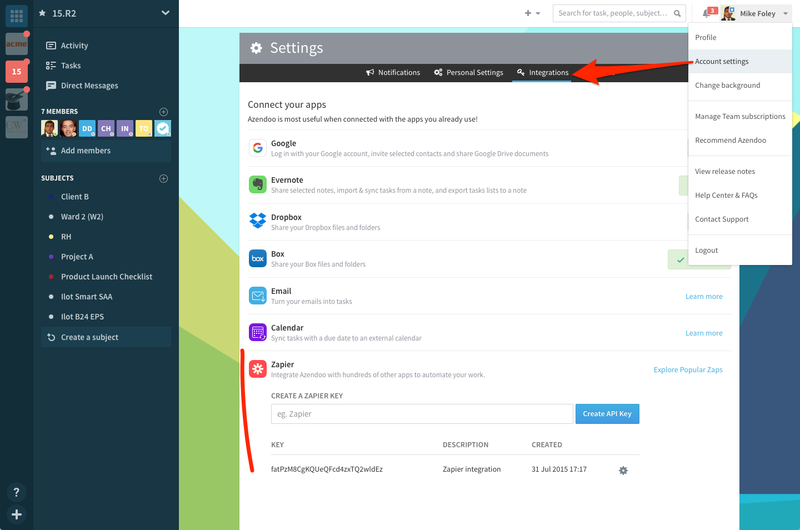 In order to do so, you need to head out to Azendoo account settings, and onto the integrations tab. Scroll down to the Zapier integration and create an API key for Zapier. Once this is done, copy the API key to your clipboard. Then head out to Zapier and create a zap, or use an existing one, with Azendoo. When prompted to connect an Azendoo account, click on the button, and copy the API key in the pop-up box. You can rename your account if you wish. Click continue and your Azendoo account is set up!